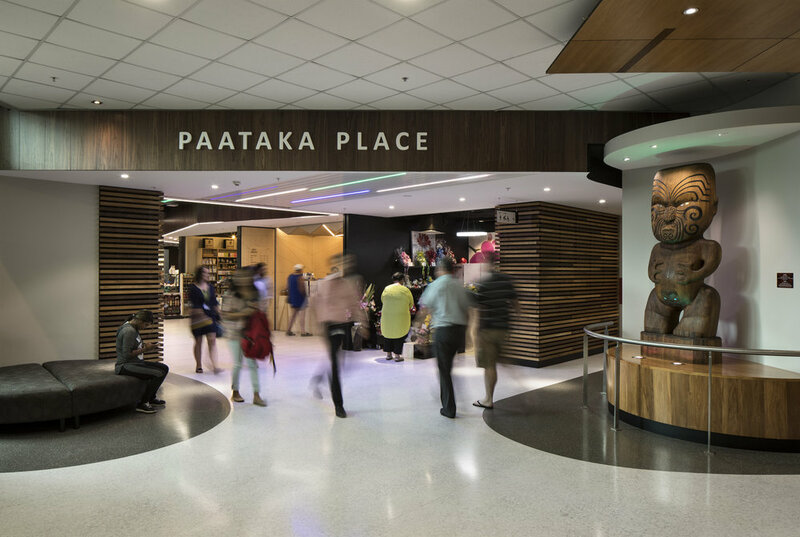 A vibrant internal ‘street’ is one of the key design features in the re-development of Paataka Place, a new retail and hospitality space at Middlemore Hospital. This introduces a direct connection to the neighbouring Edmund Hillary building, as well as improving pedestrian flow. It also provides strong commercial benefits to help support the precinct’s health and wellbeing focused retailers. Middlemore Hospital is one of New Zealand’s busiest hospitals and provides services to those living in the Counties Manukau region in Auckland. That means its retail and hospitality facilities in the main Hospital building (the Scott Building) are bustling. 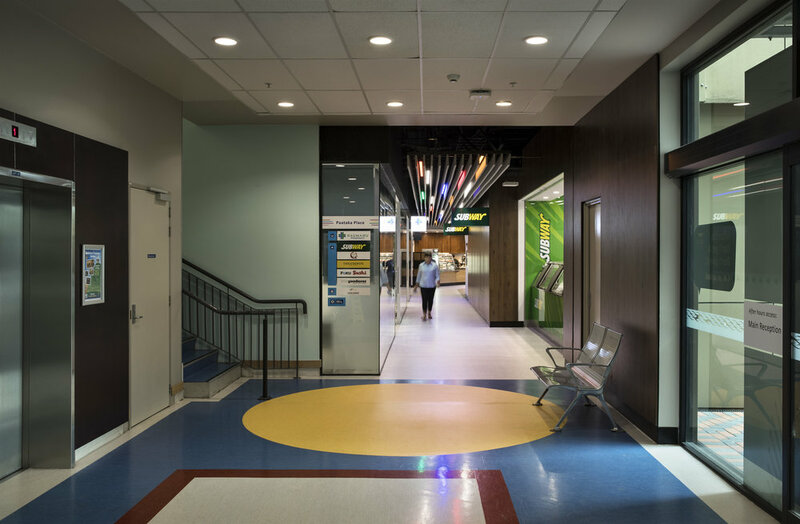 They serve as a place for people to simply purchase and consume food, as well as acting as a gathering place for patients, their whaanau (family) and Hospital staff. Having previously worked with Ignite, Counties Manukau Health tasked the specialist retail design team with re-developing the existing food and beverage area to enlarge and soften the space by creating a ‘place within a place’. It needed to provide a more welcoming environment to visitors, staff and patients alike. The team was also tasked with providing an optimal environment for retail tenants by enhancing the existing facilities and increasing their visibility to potential customers. These improvements have the additional benefit of helping attract new, high-quality food and beverage vendors who would offer nutritious, healthy-eating options. The final component of the brief was to create a visual connection with a separate, neighbouring Hospital building (the Edmund Hillary Building). The design team responded to the challenge by creating a vibrant, new internal ‘street’ – helping ease patient and visitor circulation, create a logical flow to pedestrian traffic, as well as ensuring potential customers have easy access to the different retailers. The new retail area occupies a prime location beside the main hospital entrance and features a new glazed ‘push-out’ as the façade. This not only adds light, but also allows the retail space to be extended beyond the existing ground floor footprint. The ‘street’ is lined with a mix of boutique food and convenience retailers. It is anchored by a signature café and shared seating zone furnished with an eclectic range of New Zealand designed furniture, which allows for a range of informal group settings. High-energy group tables and ‘grab and go’ leaners were also provided, which are complemented by softer and more informal lounge seating. 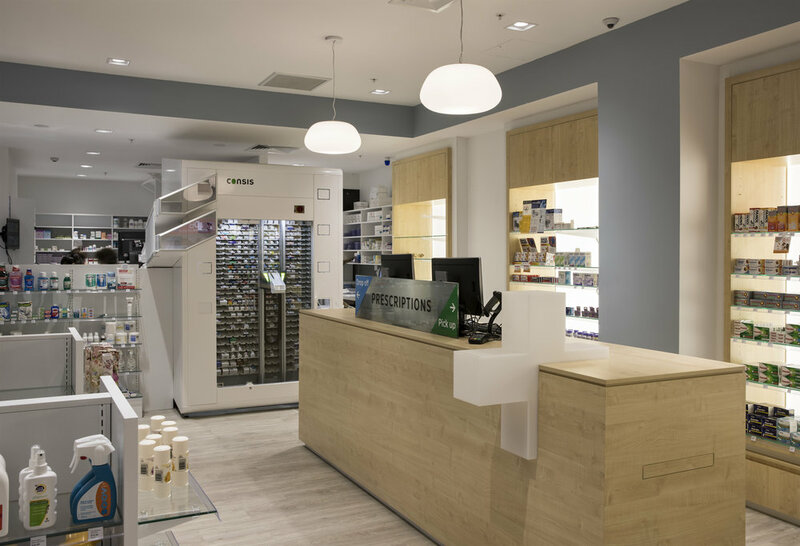 The Hospital pharmacy has also been moved to be positioned on the ‘street’ and closer to the outpatient entrance, making it more convenient for users. At ceiling height, the design team created a new sense of volume by removing existing ceiling tiles to raise the ceiling height. Acoustic battens replaced the tiles and these battens were also used as a visual guide along the main circulation route. Cultural needs have been considered, with the design team anchoring the area with a whaanau (family) lounge area, as well as visually referencing key cultural groups within the local community – Maori and Pacific Islands, as well as Chinese and Indian. Places for different age groups and levels of mobility have also been created and the Accessible Consumer Council was consulted as part of the project. The retail area is visually linked to the wider Hospital design and redevelopment work which has already occurred as part of the Middlemore Hospital Strategic 20/20 Plan. To ensure continuity, the design team have used the same material palette, such as natural timber. The ceiling battens also provide a visual link with other areas of the Hospital. They feature rainbow-coloured LED lights, referencing the rainbow-coloured themes used elsewhere, as well as providing bursts of colour to soften the space and add warmth. In keeping with the requirements of the environment, all materials are hard-wearing and easy to clean. The design team ensured the re-development could be delivered with minimal disruption and without any interruption to existing healthcare services. Where possible, existing surfaces were re-used and the design was developed to work within the existing infrastructure. The project clearly demonstrates the design team’s retail and hospitality expertise in creating successful, vibrant and commercially successful spaces.